Naturally, SPOILERS will come across in this write up and possibly in the comments. TREAD CAREFULLY! When I set out to start up SeeBonnyDraw again, I updated my list of characters who I wanted to tackle for prep work. On the top of my list were characters of properties who were coming up, or still in the current window of pop culture awareness. I was also in the middle of watching/finishing up Jessica Jones, and bumped her up to the top as I came to love the show. In comparison to Marvel+Netflix’s first partnership release of Daredevil, Jessica Jones was an altogether different beast that I had trouble getting into the same way I did with Daredevil. It didn’t rely on action and focused on psychology that created tension in many scenes that couldn’t always be solved with brawn. The relationship that was the underlying spine to the show between Jessica and Kilgrave was twisted and dark; both relied on one another to continue the story in a long game of tug and war. 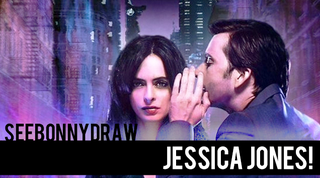 When it was time to draft the illustration, I knew it would have to feature both Jessica and Kilgrave. For Jessica, I referenced a screencap from the show and Kilgrave, played by David Tennant, was referenced from a screencap from Doctor Who! 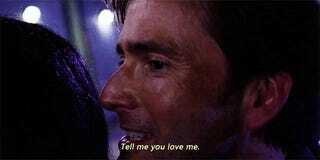 I loved the 10th Doctor, and I completely forgot he existed whenever I saw Kilgrave on screen. Ritter and Tennant killed it in their roles and I couldn’t wait to get drawing after I finished the season. I pushed through with exploring this new style I’d unearthed when listening to my mind’s natural direction during my off time. With Kylo, I pushed the angular direction to the extreme because of his Sith/dark connection. Here, I cooled it down a bit and went with a more bold direction due to the comic book origin of the characters. Speaking of which, I painted Kilgrave in his traditional purple (I’m glad they used the purple clothes to give nod to his original look in the TV show, thank Bob) while also enlarging him in this illustration. The large size is to symbolize his presence in Jessica’s psyche - always there, always watching. I put them back to back and used deep lines to mirror one another for composition. To wrap up the piece, I felt like I needed to incorporate more from the show/characters and that’s when I decided to use text to spruce things up. As a coping mechanism, Jessica recites the streets she grew up on to help her remove herself from a disturbing place mentally. I literally painted over Kilgrave’s back these streets as if she was tagging the monster herself, to own the demon. Overall, I was very pleased with the end result and while there are a few things I still have to kink out with this style (which I’m learning about more and more, and will discuss further in the next two illustrations I’ve done for SeeBonnyDraw I’ve yet to share) I think as a graphic piece it can stand up tall. Hope you guys dig the work! Please leave behind any critiques/feedback if you’ve got any or let’s talk about the show!